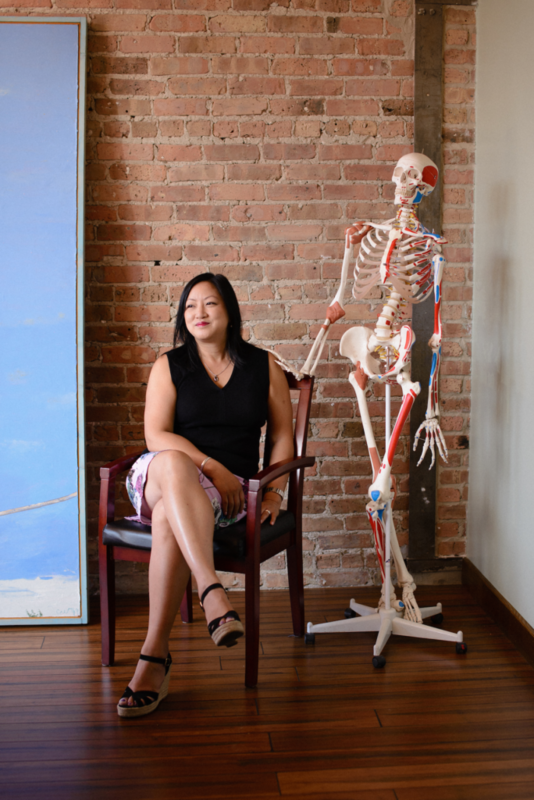 Theresa Mah spent the first part of her career studying history, but now she is on the cusp of making it. Mah will be running unopposed in this November’s general election to represent the 2nd District—which includes Chinatown, Bridgeport, and Pilsen—in the Illinois House of Representatives. If she wins, she will be the first-ever Asian American legislator in the Illinois General Assembly. In this interview, the McKinley Park resident shares her thoughts about where she has been and where she is headed. You come from two generations of US immigrants: Your grandfather was a paper son [a Chinese-born immigrant who obtained citizenship by using fraudulent documents], and your parents immigrated to the U.S. and are small business owners. What lessons have you learned from this as you’ve made your way through your public service career? The main thing I learned is that communities, especially those that are oppressed, have to form coalitions and come together and help each other. There has to be some kind of mutual assistance mechanism to fight for the community’s rights. The community that I come from in San Francisco was able to fight for survival and advocate for the things they needed when they came together, [through] networks of family and district and surname associations. Those were the organizations that were necessary in order to ensure immigrant survival. Especially [for] folks like my grandfather, who was a laborer and worked low-wage jobs. He was part of a wave of immigration that really wasn’t supposed to be in the United States. I grew up in that environment and saw my dad’s involvement [in these organizations], and that was a great example of civic engagement and community leadership from an early age. Learning about the immigrant experience was really important to me as well because, amazingly enough, here we are in 2016, and we’re still fighting for a lot of the same issues. The effort to ensure that people are able to live productive lives and earn a fair wage…and have an experience of justice and fairness—those are still things that we need to work on and fight about. How do you think being Asian American today differs from being Asian American in previous generations? I had the benefit of taking Asian American studies classes when I was at Berkeley, and so I know that we do have very different experiences today, compared to my grandfather’s days. Those were the days of outright racism, where people would get beaten and stoned on the streets. My dad would tell me about San Francisco’s Chinatown and how there were certain boundaries, like Broadway, where if the Chinese community ventured beyond those areas, there would be white ethnic gangs that would beat them up. [Asian Americans] don’t necessarily experience that on a widespread level today, but it’s important to understand that that was an experience that our forebears went through. There is perhaps a tendency in our community to embrace a model minority myth. But even though the racism against Asian Americans is not as blatant as [it was] a hundred years ago, it’s still there. There are all kinds of egregious examples of racial injustice perpetrated against African Americans. We have to have an understanding of that and be a part of the fight against it. What have you seen or experienced in terms of race relations between the Asian American and the African American communities, and what are ways in which you plan to build solidarity in the neighborhoods that you represent? Sometimes there are tensions, and there are fears and misunderstandings. But as I said before I think it’s important that we build relationships between the communities and make sure that we don’t do anything that exacerbates the racism that already exists. My hope is that we’re able to understand that we have more in common than we have differences. There has to be a unified approach to trying to address these structural problems in our society. It’s something I’ve thought about a lot, but it’s just not that easy to get people to understand how to move forward on it. The efforts that I’ve seen, for example, of Asian Americans writing letters to their parents about Black Lives Matter. That’s important. We need to support efforts like that to build understanding with the immigrant generation, or new immigrants who just arrived, and to get them to understand that there’s no way that being anti-black is going to get rid of racism. How do you think you’ll be able to increase lines of communication in your role as a representative? Recently, one of my supporters told me about an incident that happened to him in Chinatown, where some thieves broke into his car and stole a significant amount of money. It seemed like an organized effort, where these two guys drove into a parking lot, and one was serving as a lookout and the other broke into his car and stole two cell phones and a good amount of money. There happened to be surveillance video of that and it showed that it was two Chinese people. So I made a point of bringing that up to the Chinese media and at the Chinatown safety meeting—that our common assumption is that when there is criminal behavior, it’s always people outside of Chinatown coming in. And the assumption is that the criminals are always black. We should not hold on to those assumptions as closely as we do because we let our guard down and we actually decrease our awareness and our public safety when we make those assumptions because people who are involved in crime will come from all different backgrounds. I don’t think that I would necessarily have a problem speaking out about my support of immigration reform or supporting the black community and their efforts. Those are issues that the Chinese community doesn’t necessarily think of as relevant to them. But [they are], and I think that’s something that I can continue to remind them about whenever an opportunity arises. You’ve really prided your campaign in being able to bring out voters who have never even thought about engaging in politics. What issues have galvanized first time voters to start getting involved, and generally how have you encouraged first-time voters and typically apolitical constituents to get involved in community issues beyond voting? The Chinese American population in my district has been growing steadily over the last 10–20 years. When a community grows that dramatically, it becomes really clear when there’s no representation at any level in politics. People felt very strongly that they wanted somebody to represent them, to look like them, to understand their issues, the language. And that was a huge motivating factor for a lot of these first-time voters, who had become citizens but never saw the need to really vote because they didn’t’ have anybody who was like them. So I think just at a very simple level, having someone that they could relate to was really important for them. And then over the years, I’ve been involved in community organizing efforts, [which were] really important too because it takes a lot to organize a community to push for something like a resource like a library and more recently the 31st Street bus [restored by the CTA for a pilot program this fall]. But when you finish with that or you have a successful campaign, there’s something there for you to show the community, and there’s a tangible accomplishment for them to look forward to. They can see the fruits of their own involvement. Public education funding seems to be an issue that you care really deeply about. In the past you’ve talked about reforming the way that K–12 schools are funded and moving away from the property tax model. You also voice support for increasing MAP funding for public universities like Chicago State. How do you plan to push these issues forward in a political environment that is as fraught as that of the Illinois General Assembly? The effort to redo the funding formula so that it relies less on property taxes is already something that is being worked on in the general assembly. There’s a bill by Senator Andy Manar that is trying to address those reforms. I will probably end up working with him on that. It’ll be a challenge…to come up with a formula that the majority of people can be satisfied with. I’ll also be someone who is in support of changing our progressive tax structure so that working people don’t bear a disproportionate burden for bringing in the revenue that we need to support these programs and education. I think it’s time that we tried to work toward a more fair revenue system so that people who are wealthier pay their fair share. I talked a lot about that during the campaign, and it’s something that I will continue to push in the legislature. It’s something that we’re going to hear more about because we do need to come up with some structural changes and revenue is a top priority because right now, we don’t have enough. It’s a struggle to serve the people we need to serve and to maintain the programs that are necessary, so we’re going to have to have some of these challenging conversations about where we bring in the revenue and how we allocate the money that we have so that we can support public education. Your dissertation at University of Chicago was on housing segregation. How has your academic research influenced your jump to doing public service? How have you thought about your platform and steps moving forward? Studying housing segregation was an important lesson in understanding the power of public policy and how it literally shaped this time that we live in. When I was working in Chinatown as a community advocate, I was able to get something done, but it became really clear that there’s a limit to what one can get done and how much change you’re able to affect. And so that eventually convinced me that I have to take this leap and run for office so that I could legitimately have a seat at the table and have a say in the decisions that are being made that affect our communities. The funding formula for education [for example] is directly related to the history of housing segregation. The reason you have communities with low property values and very low revenue from property taxes is because you have this whole period of white flight from urban areas. People moved out to the suburbs and left the central cities with very little population and areas that were economically devastated and a public school system that serviced mostly black and brown students. The legacy of housing segregation and racial inequality in this country that we see reflected in unequal funding to education that continues and is reinforced through public policy. Because I have an awareness of that, I want to try and change it. People look at me and they see a Chinese American, and then they fill in whatever idea they have about what it means to be Asian American. But I think that my personal background is pretty unusual, and I grew up with a range of multiracial and multiethnic influences that are not that apparent unless you learn more about me. I spent my childhood up until my teen years growing up in a black neighborhood and working in my family’s small business. That was the experience that led me to look more closely at racial segregation and housing segregation. I’ve always been really focused on or interested in understanding the effects of racial inequality in our country’s history. And I’m committed in various ways to dismantle that…[and] to achieve greater equality for everyone. For me, what it means to be Asian American is to be committed to working in solidarity with other racial and ethnic groups to address issues of racial inequality in this country that we all experience, and that we all have a responsibility to work on and improve. The more I learn about Theresa the happier I am that I voted for her. Great interview! Dr. Mah is a trailblazer who will continue to fight the good fight. We just moved to Chicago…what a refreshing relational perspective and skill set Dr. Mah delivers to elevate broad community advocacy conversations and policy change!